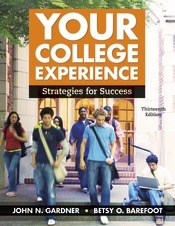 Supported by current research and author expertise, John Gardner’s and Betsy Barefoot’s Your College Experience provides today’s diverse students with the help they need for the transition to college and useful strategies for success in college and beyond. While maintaining its hallmark theme of goal setting and a continued emphasis on the ten High-Impact Practices identified by the American Association of Colleges & Universities, the thirteenth edition provides practical strategies across all topics to help students be successful from the start. This new edition features extensive coverage of motivation, attitude, mindsets, and resilience in an expanded chapter on emotional intelligence, explores new themes in a revised and peer-reviewed chapter on diversity, and includes an updated Majors and Careers chapter that spotlights current research about the economy and career success. A full package of instructional support materials—including an Instructor’s Annotated Edition, Instructor’s Manual, videos, and a Test Bank—provides new and experienced instructors all the tools they will need to engage students in this course and increase student retention.